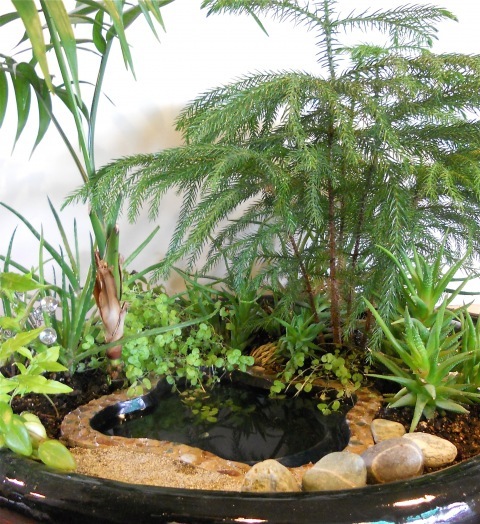 If you'd like to add a water feature to your miniature garden or dish terrarium look no further than the mini garden pond available at http://twogreenthumbs.com/. I originally spotted the above photo at The Mini Garden Guru blog. This is the very first time when I see a pond in the terratium! Thank you! Some people have great imagination! Oh my gosh - that is so adorable! Done and ordered. Thanks for the tip! I've been looking for a good way to put a water feature in my wardian case. They also carry really tiny furniture and statuary. Yay! I am happy to hear this item will be put to good use for you! Let me know how it turns out.